A 16-year-old boy was crushed to death by an over-speeding municipal corporation truck at the Tajpur road here today. Don’t fall for fake lottery prize calls! 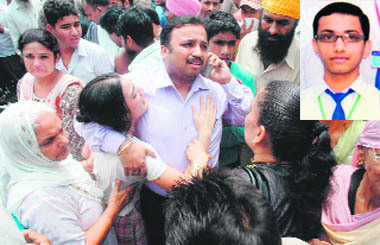 Two days back when Narinder Jain, father of Mayank, who was crushed to death by an MC truck, presented a new motorcycle to his minor son, little had he realised that the mean machine would kill his son. It’s the stink of garbage that forces drivers to accelerate trucks, said Vijay Kumar, driver of the truck that killed Mayank Jain on the Tajpur road. Waking up after three tragedies involving MC trucks, the civic body today announced a change in the route of the trucks carrying garbage to the Jamalpur garbage dump. Panic gripped residents of colonies situated along Buddha Nullah in the city after release of 56,000 cusecs of water into Sutlej river. The district administration has heightened the vigil in 205 villages following the release of 56,000 cusecs of water in Sutlej river even as the villagers themselves have started organising “thikri pehras”. The sub-divisional officers (SDOs) and junior engineers (JEs) in the drainage department are visiting Dhussi bundhs in Mattewara, Kassabad, Kehra Bet, Maddepur and Dhulewal villages. 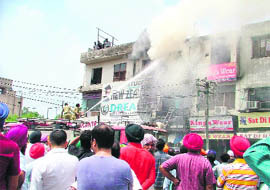 A major fire broke out at Sethi Bookshop in Model Town market here today. All three storeys in the building were gutted within no time. The stock worth several lakhs of rupees kept in building was damaged. Fortunately, there have been no reports of loss of lives. The civil dispensary of Doraha has been ultimately shifted to Araichan village, thus leaving a population of approximately 20,000 to 25,000, without any medical help and livid over the situation. Reacting to reports of incessant rains in the hills, the Jagraon SDM has deputed senior officials to ensure sprucing up of rescue equipment and machinery acquired by the department a few years ago. Indifferent attitude of the Pollution Control Board and the local Municipal Council can force locals to pay through the nose. Reason- several acres, specifically allocated for setting up of an advanced training institute-is now being used as a garbage and sewage dump and giving the residents sleepless nights as epidemic threat, according to them, looms heavily on their minds. More than 100 homoeopathic doctors working under Ayurveda, Yoga, Unani, Sidha and Homoeopathy (AYUSH) in Punjab are being discriminated against in the name of increments. AYUSH operates under the department of health and family welfare in Punjab. Doctors at the Hero DMC Heart Institute (HDHI) performed an intricate procedure to save the life of 34-year-old Monika who had developed a serious complication after the delivery of her newborn. Finally the industry has woken up to the advantages of workers’ safety, thanks to the ongoing International Industrial Expo & Conferences (IIEC) at the Punjab Trade Centre. India Medical Association (IMA) president and Desh Bhagat Group of Institutes Mandi Gobindgarh chairman Dr Zora Singh visited China and participated in the Indo-China Seminar on Rural Health Care in association with the Chinese Medical Association and Commonwealth Medical Association held at Beijing (China). Continuing with their tireless efforts to lend a helping hand to needy students, NGO Brotherhood Society today held a scholarship distribution function at Khalsa Girls Senior Secondary School. LUDHIANA: Maple Bear Canadian Play Way and Nursery School, Udham Singh Nagar, celebrated Raksha Bandhan with great enthusiasm. Kids were dressed in traditional attires. 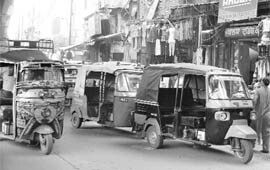 Following the public interest litigation filed by a city-based NGO against the state government for its failure to curb auto-rickshaw menace in Ludhiana, the Punjab and Haryana High Court has ordered the state government to submit an affidavit on the date of rolling out of JNNURM-funded buses on city roads. Chief Judicial Magistrate Jatinderpal Kaur has summoned Senior Medical Officer (SMO) of Lord Mahavira Civil Hospital, Ludhiana, in a case of alleged violation of the Environmental Protection Act. 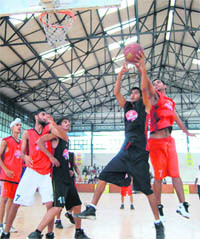 Guru Nanak International Public School (GNIPS), Model Town, defeated Bhartiya Vidya Mandir Senior Secondary School, Kitchlu Nagar branch, 23-15 in the youth boys section during the third week matches of the inaugural edition of the Mahindra NBA Basketball Challenge League being held at Guru Nanak Stadium here today. Kila Raipur Zone emerged champions in the U-14 category during the Inter-Zonal District Football for girls organised by the education department at Bhartiya Vidya Mandir Senior Secondary School, Kitchlu Nagar branch, here today. PAU Zone secured the second place. Green Land Senior Secondary Public School, Jalandhar bypass branch, along with Ryan International School, Chandigarh road, and BCM Senior Secondary School, Shastri Nagar branch, annexed titles in the boys U-17, U-19 and U-14 categories, respectively, during the Ludhiana Inter-School Chess Championship being held at Bhartiya Vidya Mandir Senior Secondary School, Kitchlu Nagar, here today.